Whoops, where did the time go? I got caught up in a parade and a world class cycling race, and that's my excuse for not posting any new bentos. In fact, I did make a few bento box lunches between last Thursday and this Thursday, but no time to blog about them. 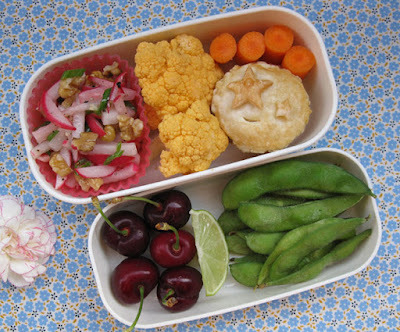 This bento box lunch uses many Sonoma County ingredients. The radish salad has radishes and spring onions from Triple T Ranch and Farms in Rincon Valley, plus Sonoma County walnuts, and even local olive oil from Kendall-Jackson! Also in this bento box: orange cauliflower (raw), a mini chicken pot pie, and carrots. In the lower compartment: cherries (first of the season from the Sebastopol Farmers Market! 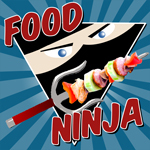 ), a slice of lime, and edamame. 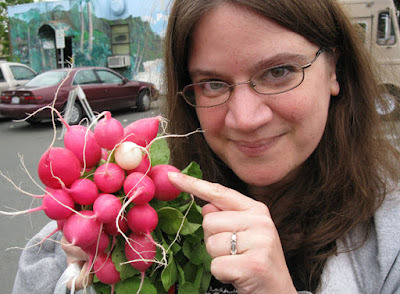 Here I am at the Sebastopol Farmers Market showing off the rad radishes I picked up. I think the lone white radish sealed the deal. 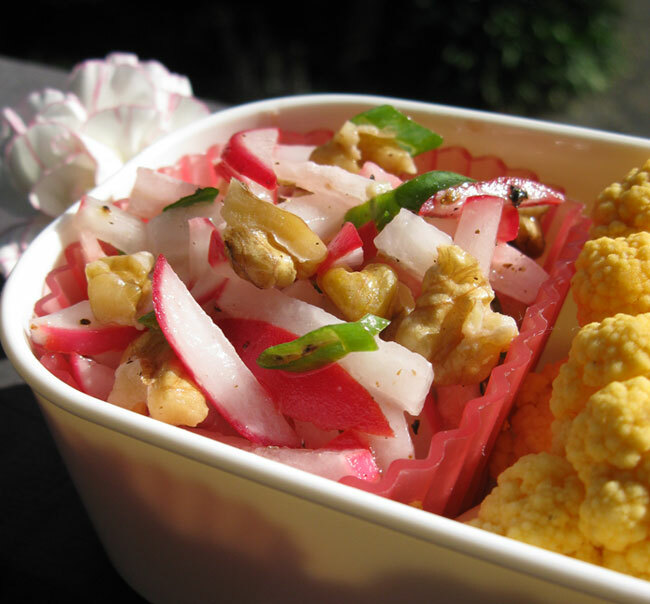 Here is a close up of the simple radish salad I put together for this bento box lunch. The recipe is below. Oh and mom is doing well. Her surgery was successful, nothing in her lymph nodes. She's resting now and will begin some radiation therapy in June. Thanks for your well wishes! Combine all ingredients. Serves one. Wine Pairing Suggestion: Since I am using Kendall-Jackson olive oil in this recipe, I think a Kendall-Jackson wine would be fun to pair with it. How about their new white blend called Summation? It has so many lovely characteristics, from honey to herbs, cream to citrus, that it will really play well with the slighty spicy salad. Plus it would be great with the mini chicken pot pie. 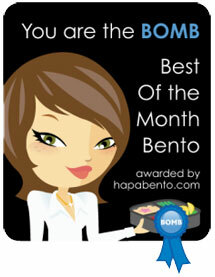 Thanks bentobird! The radish salad would also be delish with some herbs, like cilantro or parsley.